There have been mediocre movies winning the Academy Award many times before Gladiator, but Mrs. Miniver (1942), at the Harvard Film Archive on April 16 for a "Film and the Third Reich" series, might take the booby-prize cake as the most bloated and insufferable Oscar winner. Who in our multicultural age can abide the smug and moneyed Miniver family, whose noblesse oblige picket-fence country living, with crude but adoring servants everywhere, is so totally sentimentalized? Why, the first half hour of this 134-minute opus is about dear Kay Miniver (patrician Greer Garson, another Oscar winner), already under a poofy feathered hat, buying another way expensive one and then fretting how to tell her husband. Not to worry! Pipe-puffing, tweedy Clem (Walter Pidgeon) has plunked money down on a new roadster. Who is he to complain about his dear wife running up a shopping bill? Then War comes to the Minivers. This sterling tale takes place in 1939 England, though Hollywood-shot on an MGM sound stage. It's those nasty Germans, you see, and Clem and his villagers take their little boats down the river to rescue the British at Dunkirk. Meanwhile, Mrs. Miniver fights the war at home, when a wounded Nazi flyer lands in her flowered back yard. Though she treats him politely, the uncivil fellow brags about the Germans destroyed Rotterdam in two hours, killing thousands of women and children. 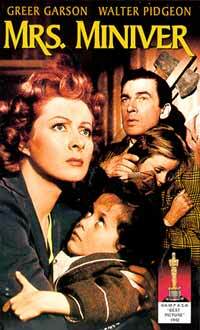 Before turning him over to the police, Mrs. Miniver does the unthinkable: she slaps his impertinent face! This was the movie that Winston Churchill endorsed for inspiring the British people, and that Franklin Roosevelt wanted rushed into the theaters so that Americans could better understand why we were going to war in Europe. What kitsch! What hooey! The smug Miniver family having fresh-brewed coffee in their shelter as bombs explode outside! And that famous ending in a ruined Church of England, in which the inspiration to fight World War II (Hitler's "Jewish problem" is never mentioned) is a singing, stiff upper lip, of Onward Christian Soldiers.